T. D. Jakes has 1 media appearance. T.D. Jakes signs Before You Do: Making Great Decisions That You Wont Regret. Thomas Dexter "T.D. ", Sr. Jakes , Before You Do: Making Great Decisions That You Won't Regret. T. D. Jakes's book Lost and Found: Finding Hope in the Detours of Life was available from LibraryThing Early Reviewers. T. D. Jakes is currently considered a "single author." If one or more works are by a distinct, homonymous authors, go ahead and split the author. 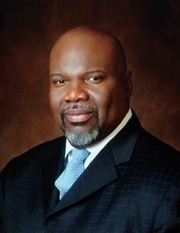 T. D. Jakes is composed of 10 names. You can examine and separate out names.